As part of the Harvard Horizons symposium at Sanders Theatre, Ph.D. student Hansun Hsiung argued that the latest education craze of distance learning began with the printing of the first international textbooks in the 18th century. Distance learning is typically thought of as a relatively modern innovation — accelerated through the Internet and online classes. But Hansun Hsiung, a Ph.D. student in East Asian languages and civilizations, isn’t convinced. 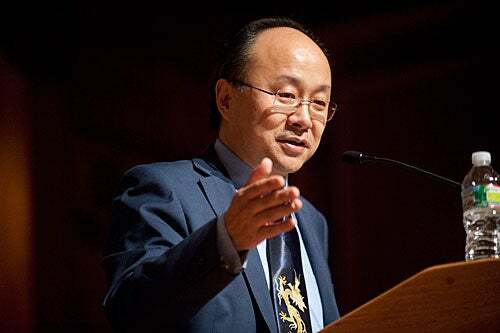 As part of the Harvard Horizons symposium, May 6 at a packed Sanders Theatre, Hsiung argued that distance learning began significantly earlier, with the printing of the first international textbooks in the 18th century. “The textbook as we know it was a fairly recent invention,” developing only in the second half of the 18th century and rising in use over the course of the 19th, Hsiung told the audience. For readers, he said, the access such books provided was considered in the same light as online learning is today. Access to the textbook “promised that every man could be his own teacher,” Hsiung said. “No matter who or where you were in the world, as long as you had the right textbook,” you — as a reader — could share in long-distance learning. Created this year by the Graduate School of Arts and Sciences (GSAS), the Harvard Horizons initiative highlights top research by doctoral students. One of the goals is to foster a greater sense of intellectual community across Harvard’s graduate schools. Another: to help students develop crucial presentation skills. The culmination of the initiative was an afternoon symposium in which eight Ph.D. students each offered five-minute presentations, styled on the popular TED talks, about a specific aspect of their current research. GSAS Dean Xiao-Li Meng, Ph.D. ’90, hosted the event, which was attended by Provost Alan M. Garber ’76, Ph.D. ’82, and FAS Dean Michael Smith. In a video address, President Drew Faust emphasized the importance of the symposium. While the presentations may have looked simple, they were the result of weeks of work. After being selected from 55 applications, the eight members of the inaugural class of the Society of Horizon Scholars underwent a five-week training course that included mentoring sessions by Harvard faculty members and experts from the Derek Bok Center for Teaching and Learning. The sessions, which focused on voice and on visual presentation skills, among other topics, were led by Laura Frahm, an assistant professor of visual and environmental studies, and Pamela Pollock, an assistant director of the Bok Center. Harvard Horizons was the brainchild of Shigehisa Kuriyama, chair of the Department of East Asian Languages and Civilizations. Equally important, Kuriyama said, have been the social aspects of the program. Given the focus and time research demands of students, it’s unlikely any of the Horizon Scholars would otherwise have met each other. Meng said he sees the initiative as filling an important role in helping provide much-needed training in the communication skills students require — as teachers, as scholars applying for grants and fellowships, and in their professional careers, whether in academia or in policy, corporate leadership, or industrial research. Going forward, Meng said, he hopes to explore how to expand the program to ensure more graduate students receive the benefit of such training. “We now have about 10 departments that include various courses on how to communicate,” he said. “Regardless of what your career may be — some of these students may become professors, and others may go into business or government — communication is a skill that is absolutely critical. The purpose of the 16th Workforce Management Conference was to give employees “actionable tips and tools” on diversity that they could “bring back to day-to-day work.” Leading the discussion was Shilpa Pherwani (pictured) of Ibis Consulting Group, who guided attendees through exercises focused on the impact cultures make on collaboration and teamwork.